NOTE: The DR650S-2CH-Truck has been discontinued, please click here to see the newest version: DR750S-2CH-Truck. Now available, the new 2017 BlackVue DR650S-2CH-Truck replaces the previous generation DR650GW-2CH-Truck. The new DR650S-2CH-Truck is a 1080p Full HD dual lens dash cam with local access over direct WiFi connection, or cloud-based access via third-party WiFi hotspot, GPS speed and position logging, and waterproof rear camera with infrared LEDs, for trucks, commercial vehicles, and other applications where mounting the rear-facing camera on the exterior of the vehicle (rather than on the interior) is necessary. For all the fleet and commercial drivers out there, there’s the new and improved BlackVue DR650S-2CH-Truck 1080p Full HD dual-lens cloud-capable dashcam with GPS, local WiFi hotspot, and 720p HD waterproof rear camera. This professional system offers a suite of features for those CDL drivers who are in their vehicles more than anyone else: the dash camera itself records in full 1080p HD which is saved to an internal industrial-grade microSD memory card. A rear-facing camera has your back (literally!) allowing you to get a more complete view of the situation in case of accident or emergency. The waterproof rear camera ensures that you get a perfect image, regardless of weather, for enhanced security. 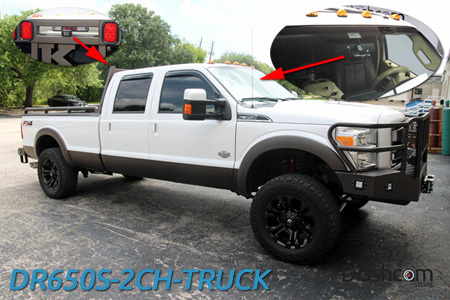 The 2017 BlackVue DR650S-2CH-Truck has a toggleable local WiFi hotspot which enables you to connect to the camera and view the files and settings on any of your smart devices. These WiFi capabilities also support live viewing from both the front and rear lenses, which allows you to ensure the cameras are pointed correctly. Improved GPS performance in the 2017 model enable unprecedented data acquisition such as timestamped positioning and speed logging, which makes this a great investment for drivers and managers alike. Audio cues (voice alerts) from the device will alert the user to any changes or enabled features, allowing for the camera itself to be sleek, discreet, and screen-free. All data from the camera can be accessed wirelessly from the BlackVue app, available on iOS or Android. Protect yourself and your business from high insurance premiums and false liability with the BlackVue DR650S-2CH-Truck. Commercial vehicles from all industries will enjoy the extra protection, whether you’re a local-sized domestic service (everyone from pest control to plumbing) or managing a nationally-sized long-haul transportation service. Accidents can be unavoidable, but you can arm yourself with the dashcam defense, including BlackVue’s Over-the-Cloud remote access and monitoring service (remote cloud-based service requires a separate WiFi hotspot in the vehicle). This model includes a set of features designed to give you maximum security even in the dark of night: the rear-facing camera has infrared LED lights to ensure a clear picture from the rear camera, regardless of the lighting conditions. The optional Power Magic Pro add-on will enable you to capture video even while the vehicle is parked and turned off, with optional fuse taps to enable easy installation of a battery-conscious, low consumption option for 24/7 monitoring. No matter if you’re facing a claim from a midnight fender-bender or an afternoon parking lot collision, the high-quality time-stamped video feed can help you contest the ever-inconvenient insurance fees. The DR650S-2CH-Truck dashcam includes either a 16GB, 32GB, 64GB, or 128GB BlackVue Class 10 industrial-grade memory card. You may choose the BlackVue microSD memory card size above. The memory card is provided by BlackVue and is already installed inside the DR650S, ready to go! We do not sell the DR650S-2CH-Truck without a memory card, as they are pre-installed by BlackVue inside the factory-sealed packaging. While the memory cards are removable and the card slot will accept other brands of microSD memory cards, we strongly suggest the use of ONLY BlackVue memory cards in the BlackVue dashcams. The BlackVue OEM memory cards are industrial-grade and are designed to withstand the extreme high and low temperatures of being inside of hot and cold vehicles day in and day out, and they are also designed to cope with the constant read/write cycles of a high quality dashcam, without fail. The Dashcam Store™ is unable to offer support when non-BlackVue memory cards are used. To ensure your dashcam is always recording, stick with the most reliable memory cards on the market today! The DR650S-2CH-Truck includes FREE priority ground shipping within the continental United States. Expedited shipping may be selected during checkout for an additional fee. International shipping is not available on this item, except to North America (Canada or Mexico). An improvement building on the success of the proven DR650GW-2CH-Truck. Nothing has been sacrificed from the previous version, so with the addition of higher video quality and the free BlackVue Over-the-Cloud service, this system is an absolutely perfect solution for those looking for a high-tech dashcam setup in their personal or fleet vehicles, where an externally-mounted rear-facing camera is a requirement. Please note, this item can only be shipped to addresses inside the United States, Canada, or Mexico. We apologize for any inconvenience to our international customers. The Dashcam Store™ is an authorized USA distributor of the BlackVue product line. Beware of unauthorized or grey-market third-party sellers!